Flat pack furniture made at Knockaloe. © MNH. 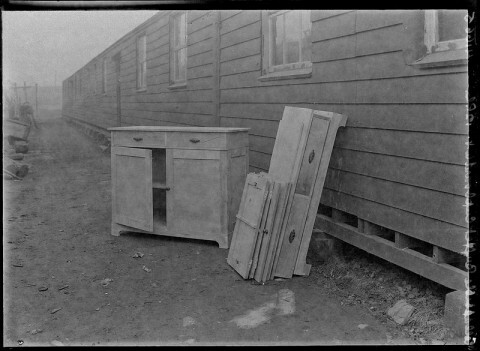 Employment inside the camp ranged widely from the assistance of the day to day running of the camp to a number of projects designed to provide material for those in need including the production of shoes and boots for women and children and a range of ‘flat pack’ furniture which was sent to France to help families in need. Items were also made for military hospitals including toothbrushes and a large range of walking sticks and crutches. 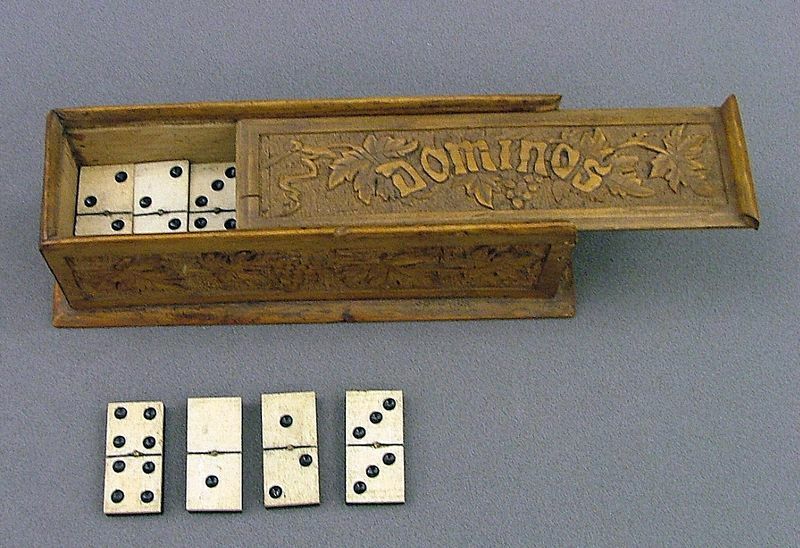 The manufacture of items such as these again had a dual purpose for the internees who supported the allies in the war and wanted to be able to do something to support the war effort. The production of these goods enabled them to contribute something when their circumstances would not allow them to join the forces and fight. J.T. 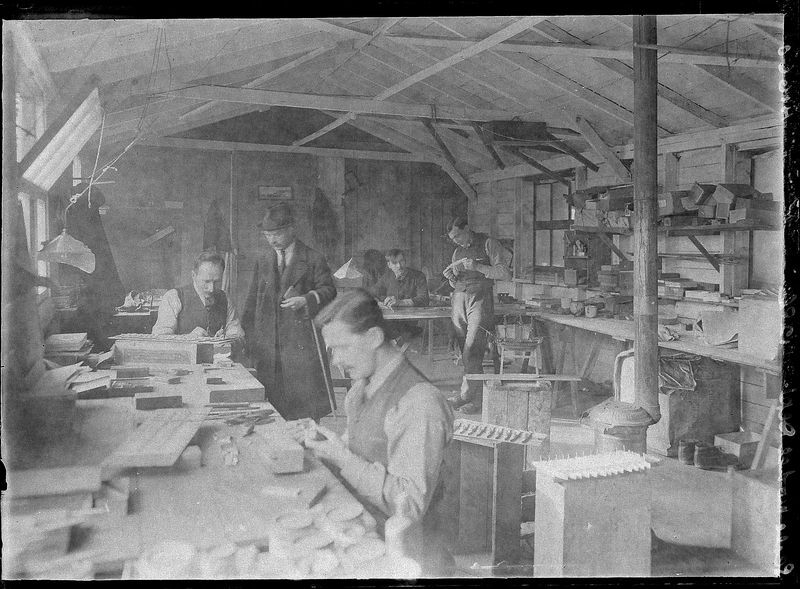 Baily (2nd from left) and internees in woodwork shop. ©MNH. One of the most influential characters in the story of Knockaloe is that of James T. Baily a Quaker who was a teacher of handicrafts and employed as Industrial Adviser by the Society of Friends to help with the development of craft work production at Knockaloe (Braithwaite Thomas 1920, 68). Baily wasted little time in encouraging the internees to use their skills and develop workshops manufacturing anything they could put their hand to. The best known of these objects today are the carved bone vases made from the long bones of cattle and woodwork, particularly picture frames and boxes. Other items included jewellery, puppets, a variety of metalwork and textiles. The camp also had a bookbinders and printers although with the exception of some artwork the printers were predominantly producing material for consumption within the camp. In order to ensure they had enough space for these activities the internees requested to be allowed to use the camps dining huts as workshops. Permission was granted and the huts were converted while the internees took their meals in their accommodation huts for the duration of their detention. Bone dominoes made at Knockaloe. ©Knockaloe Archive. A further contribution to the war effort was made via the sales of the craftwork via the Quakers. Catalogues of material on offer were produced and buyers could pre-order items and have them inscribed with mottos, names or specific designs. The sale of these goods was not of course immediate as time was needed for many of the men to develop their skills. Some crafts were easier than others to pick up and areas such as basket making became incredibly popular. Markets were found for the goods in the United States, Sweded, Norway and Demark and material was also purchased through the guards and staff of the camp for local people. 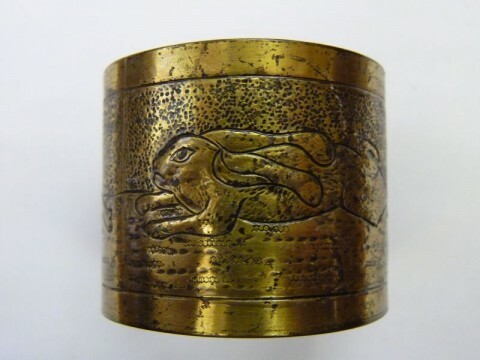 Brass napkin ring made at Knockaloe. ©Knockaloe Archive. Through the efforts of Baily and the Quakers approximately 78% of internees were employed in some form of work (see Report on Knockaloe Camp, IOM) by 1916. The work in itself provided a way to pass time and distract from the struggles of being in the camp and worries of what was happening outside of it. Payment for the items sold and the competitive element of the exhibitions acted as incentive for the men to continue focus their time and energy.